1 out of every 2: What do half of all Russians believe? Opinion polls are regularly published in Russia containing curious facts about ‘every second Russian’ – according to surveys half of the population pray, steal items from hotel rooms and live in anticipation of a war, among other things. RBTH found out more. Sociological services often publish polls in which exactly half of Russian citizens agree with one and the same opinion. And if a Google search for "every second Russian" can yield some quite unexpected results – we see that while one Russian in every two is rather militaristically-minded, roughly the samepercentage are intimidated by superstitions – and we could well be talking about the same people. Sociologists have found that even 25 years on, many Russians have not forgotten how “happy” they were in a country that no longer exists, despite the economic problems and hardships of the era. 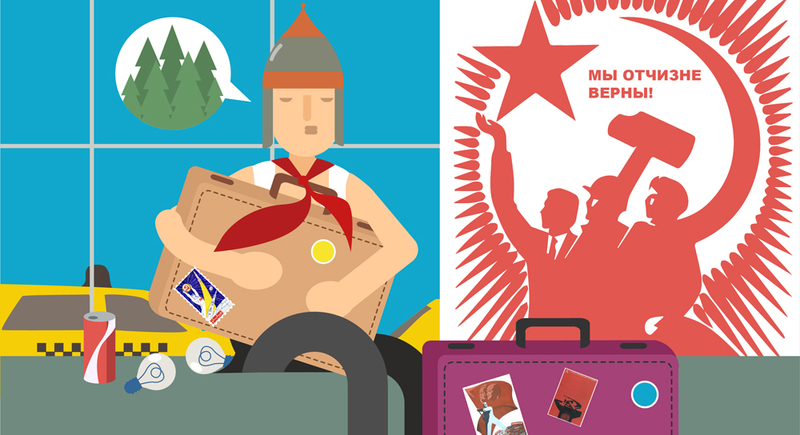 Today, half of Russian citizens would like to return to the Soviet Union. So perhaps it is no surprise then that every second Russian (52 percent) is ready to exchange the market economy and private property for an economy where everything is planned and distributed by the state. Almost as many (54 percent) have positive feelings about Stalin, the "leader of the peoples," and admire his wisdom. At the same time, however, about half of Russians see Stalin's repressions as a crime. This goes together with a strong army, which a good half of the inhabitants of Russia dream of – and they don’t mind if its impact on society is strengthened. After all, the country’s enemies are not sleeping: Every second (48 percent) Russian believes that a military invasion from the outside is realistic. Perhaps that's why half of all Russians back censorship on the internet and believe that special attention should be given to foreign news websites – you never know what they'll write. Security comes before everything else, with one in every two Russians ready to send troops back to Syria in the belief that this will help protect Russia. However, half of the Russian population don’t have any warm feelings toward those who were in power during the decline of the Soviet Union or after its collapse: 47 percent believe that the last Soviet leader Mikhail Gorbachev (who is also called the father of glasnost and democratic reform) did nothing good for his state, while the first Russian president, Boris Yeltsin, created a crisis in the country (50 percent). However, even if nostalgia for the Soviet past is rooted deep in the hearts of half of Russians, 50 percent also see today's Russia as a great power. Every second Russian has already felt the weight of the economic crisis on their shoulders and switched to buying cheaper products. Half of Russians are also concerned that people are getting poorer and the 1998 default could be repeated in 2016. But at the same time, half of the people in Russia believe that the government has a real anti-crisis plan, and the same proportion are even still willing to tolerate Western sanctions in the name of the Kremlin’s foreign policy in Ukraine’s Donbass region, which they see as right. After all, as it turns out, every second Russian does not follow even the dollar exchange rate, with the same proportion not using a smartphone, preferring simple (and cheap) gadgets with a minimum set of features. And if one out of every two Russians wants to relax – they have a dacha. This is where they spent their summer vacation last year. If, however, Russians find the courage to go away on vacation, one in every two cleans out their hotel room before leaving – perhaps it helps them to survive in a crisis. They might want, one study found, just about anything – some take toiletries, bathrobes and the contents of a mini-bar, while the particularly sophisticated ones steal hangers, batteries from a remote control or light bulbs, unscrewing them from lamps. But every second Russian looks positively at life on the whole. They are confident that they could easily find a job in the case of dismissal, and it will be no worse than the previous one. It does not bother them. Half of all Russians treat unrecognized states – at least ones in the vicinity of Russia – with the same laissez-faire attitude; if they want to exist on their own, so be it. In their opinion, South Ossetia, Abkhazia, Transnistria and Nagorno-Karabakh should be independent and have the right to self-determination. After all, if something happened, it was by God's will – every second believes in providence, too. And, by the way, according to around half of Russians, religious miracles are a real thing – as real as witches and black magic. That's why every second is sure to be scared of the prospect of being cursed, and sometimes this can even stop them from acting.